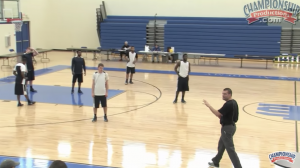 This competitive team rebounding drill is demonstrated by Bradley Men’s Coach Brian Wardle. This rebounding drill to emphasize to your players the importance of competing to rebound is scored over a series of practices. The drill is a 3 minute drill. You get a point for a defensive rebound and get to stay on defense with the inside rebounding position. The idea of the post is to stimulate ideas. You should change the rules, scoring, timing, expectations, techniques, and emphasis of any other coaches’ drills that you see anywhere to fit your team’s needs.